We will select a winner by the end of this year! 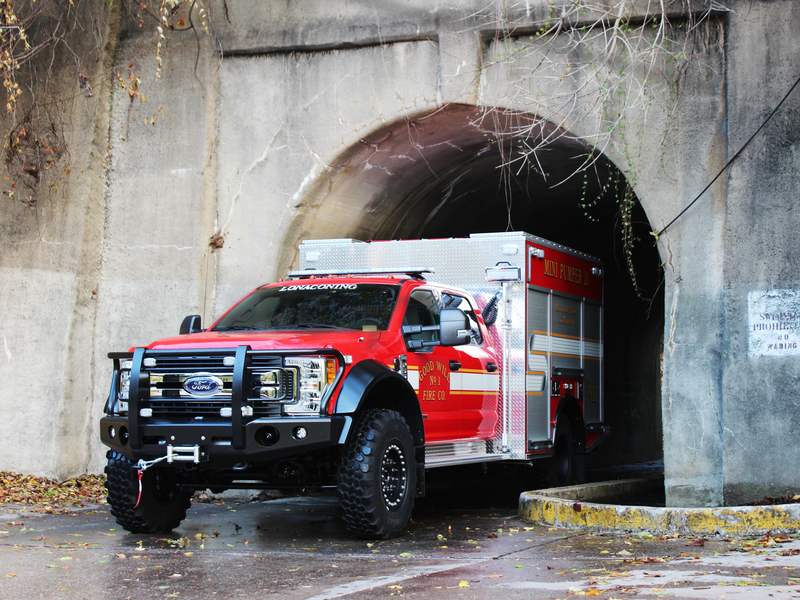 DBL Design is known for our brush trucks and fire/rescue vehicles. The F450 and F550 make an excellent platform for these applications but need a few additional upgrades to ensure they are up to the job. The Stage 1 kit gives the trucks exactly what they need to handle the unpredictable terrain. Our Severe Duty upgrades have been featured on numerous search and rescue, disaster relief, off-road ambulances, and wildfire brush trucks. Feel free to follow our Instagram to see more pictures of our projects. We know you are busy being a hero and don’t have unlimited time to figure all of this out, so we are here to help. Contact us if you have any questions or would like to talk through your build with us. We are experts at what we do and are a one stop shop for truck upgrades. We are giving away a Stage 1 brush truck kit for a lucky volunteer fire department! Enter your department to win! This mini pumper is an example of a Stage 1 kit. A type 3 engine brush truck builder often takes our trucks after they have been converted and fits them with the water tank, pump, storage compartments, interior controls and any other special requirements a department may have for their brush trucks. We do offer a new bumper that fits the WARN winch perfectly. The VR 12 Warn is the popular option for brush trucks. A 6x6 brush truck is also an option. For additional weight this makes an excellent option and provides the additional grip necessary. The chassis, body, and tank. Fuel, lubricant and other chassis or component fluid tanks or reservoirs. Full water and other agent tanks, if equipped. 250-pound weight capacity in each seating position. Fixed equipment such as pumps, generators, reels and air systems as installed. Ground ladders, suction hose, designed hose load in their hose beds and on their reels. If the apparatus is designed to accommodate SCBA, an additional 25 pounds per seating position to the miscellaneous equipment allowance. If the vehicle will be used for the towing of other equipment such as an equipment trailer or boat transporter, NFPA 1906, Chapter 12, Section 12.3.6 would apply to the truck chassis and systems. According to that section of NFPA 1906: "The Gross Axle Weight Rating (GAWR) or Gross Vehicle Weight Rating (GVWR) of the chassis shall be adequate to carry the weight of the fire apparatus when loaded to its estimated in-service weight as defined in 12.1.2." Thanks to your support! We are proud to help firefighters do what they do. We do our very best to help you in return.